It's a vacation I'm familiar with, though with more tandoori chicken. I love the smell of the chicken cooking as I walk by the restaurants here. On our first afternoon in the area, Eric and I took a tour to some of the must-sees around town. My favorite by far was our first stop at the BOH Tea Plantation. The visit to the factory reminded me of childhood trips to Hershey, Pennsylvania, where a quick "how to make chocolate" tour deposits you in the gift shop next to hundreds of bags of candy. At BOH, we took a short walk through the tea factory, then settled in to share a pot and try a strawberry tart while looking over the plantation. I could do this every day. This is Eric's new head shot for his modeling career. The next stop was a Bee Farm, which still strikes me as a dangerous attraction. After a quick run through the garden to get some photos of flowers, we left to avoid the little flying stingers. I suppose this is necessary when you're asking tourists to pay to see your bees. Happily the bees require a lot of lovely flowers. We breezed through a vegetable market quickly, admiring the variety of produce. The next stop was the most terrifying Butterfly Farm I've ever seen. Our new Canadian friend Elodie holding a whip snake. Behind her is the tank for the venomous temple viper. I mean, come on. I came for the nonthreatening butterflies. Aren't butterflies enough? Why do there also need to be snakes, scorpions, and giant beetles? For the first fifteen minutes of the tour our guide would pull out some creature that would haunt my dreams and say, "Here! Want to hold this? I'll put it on your arm!" On the plus side, there were extremely fluffy guinea pigs, too, but I don't think they made up for the nightmares I was sure to have. At the Strawberry Farm, our guide explained that Malaysia does not export strawberries. 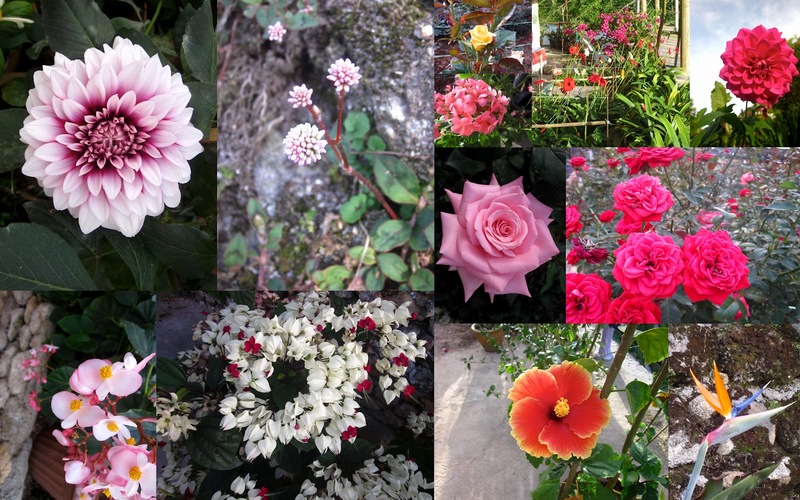 They are only grown in the Cameron Highlands for the tourists. He then left us there to buy strawberry ice cream. Our last stop of the day was a rose garden. It was late and we had been sitting in traffic, so none of the members of our tour group were particularly excited about spending forty-five minutes walking around a pay-to-enter garden. However, it turned out to be my second-favorite location of the day, filled with blooms that I didn't realize existed in nature and beautiful views of the area. This felt like walking through an enchanted garden in a fairy tale. Since that first afternoon, we've settled into a familiar routine to the one we kept in Philadelphia. Get up, get some coffee, and get to work for the day. I've been getting some writing done (though I spend too much time goofing around online. I get lost in the recipes on Smitten Kitchen.) and am feeling good about my progress. Between the weather, the food and the productivity, we're both happy to hang out here for a while. Do you like visiting mountain towns? like a scorpion-filled butterfly farm?